Most of our shopping is done online (Amazon, EBay, TireRack, etc…) these days. However, every once in awhile, we still venture into a brick and mortar store for things which we can’t easily get online. One of those things is a car battery. The primary reason is when a car battery dies, you need another one immediately. Waiting a few days for it to arrive via UPS is just not going to cut it. We first noticed the battery problem on Sunday when the car wouldn’t start. A quick jump with the JNC Air brought it back to life and we had no more problems until yesterday. The battery just would not hold a charge even after we had driven it for a while. 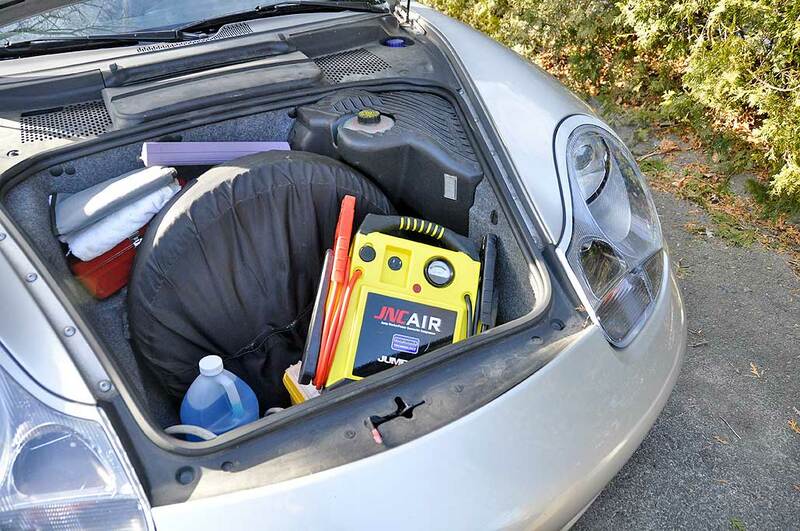 Good thing we had brought the JNC Air with us, as we had to jump the battery every time we needed to start the car. Needless to say, we had to deal with the problem immediately. First, we tried to revive the battery by recharging it overnight with the ProLogix charger, but it was just too old. How old? We dug out the original receipt and discovered it was almost 7 years old! We purchased it from Sears in 2004 for $112. The DieHard battery was fully guaranteed for 3 years and pro-rated for 100 months …that’s 8 years! Hmmm…would we actually get something for this dead battery? We brought the battery into the Sears Automotive Center in Dedham. It was a small building next to the main store, but they had three cashier stations. Clearly this shop gets a lot of foot traffic. The shop was well-organized and spotless. We were helped right away by a very nice older gentleman who clearly knew his batteries. He asked for our name, found the original invoice in the system and informed us that there would be a $31 credit for the dead battery! How awesome is that? Ten minutes later, we were out the door with a new battery, hopefuly good for another seven years. A thoroughly excellent shopping experience. Once back home, we had no problem installing the new battery. The thing with replacing the battery of a Boxster is that it is a bit awkward. Unlike most cars, the battery compartment is near the windshield and toward the center. Care must be taken when trying to maneuver the heavy battery into place. If not careful, one could end up dropping it on the side fender or into the trunk. The battery was held in place by the terminal clamps and the anchor. All three nut can be easily loosened by simple tools. Installation was the reverse of removal. The entire project was done in less than 15 minutes. With a snow storm forecast for tomorrow, we wanted to get the battery issue resolved today. 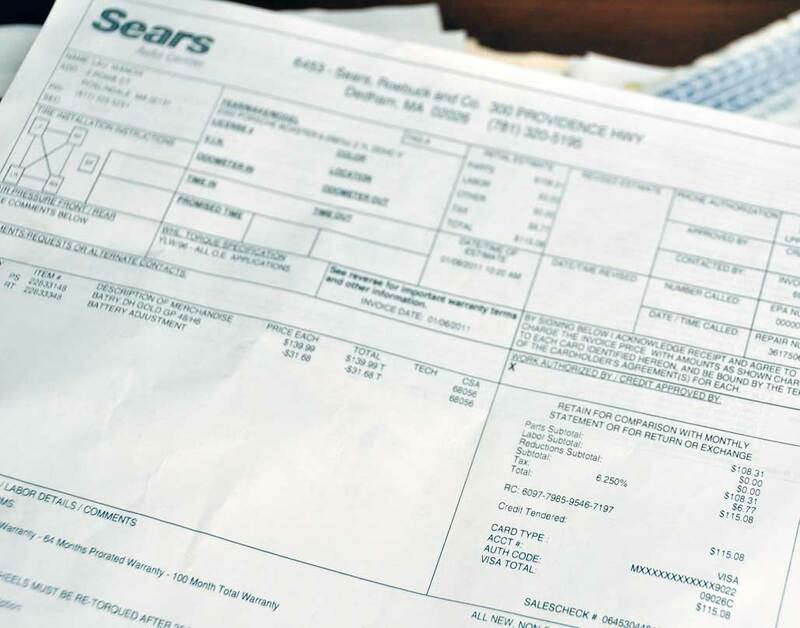 Sears made it quick, simple, and less costly than we had expected. None of our usual online retailers would have even come close! One thing is for sure, we are getting all of our car batteries at Sears from now on. We will go back soon and see if the same pleasant shopping experience holds for the main store.